When is the best time to see humpback whales in Hawaii and which islands are the best for watching? The Hawaiian Islands are a national marine sanctuary for humpback whales — a protected environment for these amazing creatures to breed and give birth. It’s such a delight to see a humpback whale’s spout (breath), or tail break the ocean’s surface, and absolutely thrilling to see a whale breach by jumping out of the water and creating a big splash. When we visit Hawaii during humpback whale season, we spend just about every spare moment whale watching. It’s truly addictive. If you want to see humpback whales on your Hawaii vacation, we’ve gathered some fantastic data and information to help you decide when and where to go. When is the best time to see humpback whales in Hawaii? 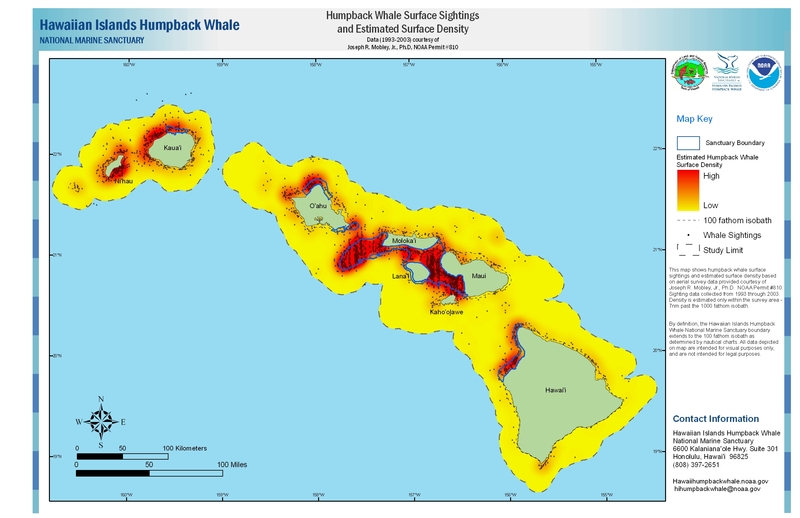 In your research, you may have seen different timeframes defining humpback whale season in Hawaii. November, December and January are frequently listed as the start of the season with April and May usually designated as the end of the season. NOAA says the season runs from November to May, but there are certainly highs and lows within that timeframe. To better explain Hawaii’s humpback whale season, we’ve created an easy to read chart to help you understand how likely it is that you may see humpback whales based on when you visit. Likelihood of seeing Humpback whales? Where are the best places to see humpback whales in Hawaii? Humpback whale density map by Joseph R. Mobley, Jr., PhD. Sourced via NOAA. Click here to view a larger map. We’ve visited all of the Hawaiian Islands during humpback whale season. When choosing a hotel or condo, from our experiences, we’ve found that the very best humpback whale action is along West and South Maui and the Kohala Coast of Hawaii’s Big Island. The above density map only reinforces our experiences. Putting it all together – how to maximize whale watching in Hawaii. So, if you really, really want to see lots of humpback whales on your Hawaii vacation, go during the peek of the season between January, February and March. It is generally believed that February is the absolute peek of the season. Stay at a hotel along the areas of high humpback density. We recommend West or South Maui and the Kohala Coast of the Big Island. See our where-to-stay guides for Maui and the Big Island for insights on accommodation selection. Whale watching boat tours can offer a closer view of humpbacks. Most whale watching tours run from mid-December through March to mid-April. If you are visiting during one of the months of low to medium humpback whale activity or from one of the islands that have less activity, taking a boat tour can help increase your chances of seeing whales. It’s easier to see humpback whale activity when you have a bit of elevation above ocean level. From a cliff near the ocean or even a high floor of an oceanfront condo building or hotel offers a larger viewing area for whale watching. Try not to spend too much time looking at your camera screen. It’s really difficult to capture the perfectly framed and timed whale photo. Allow yourself time to enjoy the view with your own eyes and worry less about trying to capture a photo. No matter when you go to Hawaii, we hope you have a whale of a time! I used to work on a sailboat in Maui for 4 years and the business whale activity times were definitely between Dec – Feb.
We have always stayed on the south coast of Kauai in January and see many humpback whales, even in close.